The ‘EU Plastics Strategy’ is guiding Multivac to use recyclable, fossil material-reducing, or renewable materials when packing fresh produce. Demand for recyclable packaging in particular will increase strongly in the near future. The boost from retail can already be seen with grapes and soft fruit, for instance, which are packed in top seal trays more often nowadays, instead of plastic clamshells. But more of an effort can be made in packed fresh produce. For example, it’s possible to pack soft fruit, mushrooms, grapes or tomatoes in cardboard trays with top seal. The top seal can even be provided with various kinds of perforations, including the Multivac X-Mesh concept. 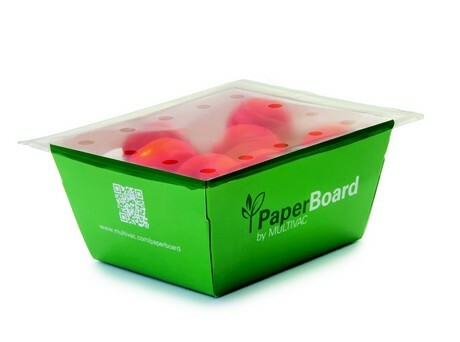 With Multivac PaperBoard, Multivac, one of the market leaders and a prominent player in the field of processing and packaging technology, offers a broad range of solutions that produce completely recyclable packaging based on paper fibres. Packaging is firstly meant to protect the product. With food, however, packaging also ensures an improved use and longer shelf life. Plastic composites have necessary barrier characteristics and can easily be processed in packaging machines that are often used for this goal. A new German law for packaging, which will come into effect in 2019, and the European Strategy concerning plastics, which came into effect in January 2018, have as their goal to combat the enormous global increase in the production of plastic. Their aim is mostly to introduce a recyclable economy for plastic producers and to decrease the use of plastic. This isn’t new to Multivac. As a market leader, Multivac wants to develop innovative machinery concepts with their technology, and they want to set the tone in the field of packaging quality, efficiency, material saving and reducing packaging on the market. Multivac is also convinced that alternative materials can be used to create far-reaching, sustainable prospects for the future. Multivac PaperBoard offers various solutions for the production of packaging based on paper fibres. To this end, Multivac works with prominent producers to create suitable packaging material that can be used in their standard systems. Deep-arch packaging machines and tray sealers can be adjusted completely to the performance requirements of the customers. Because of this, they ensure better packaging quality, higher output and a larger process reliability. Besides, a combination of input, output and labelling modules ensures completely automated packaging solutions that meet all efficiency requirements. For instance, both MAP and skin packaging of paper fibres can be implemented into Multivac systems. The material can be used on rolls or sheets, and prefabricated trays can be used as well. 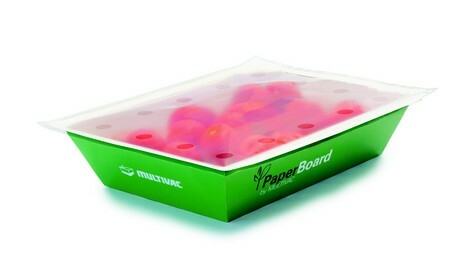 All materials can be separated by the final user, and the paper tray is recyclable. Thanks to the functional layers, packaging on a paper base can be produced that meet the barrier requirements of plastic composites. Both the paper tray and the paper composites can be recycled. However, it should be kept in mind that regulations may vary per country. An additional advantage of a paper tray is that it can be printed in various manners. Because of this, the product is more noticeable when it’s in shops. Larger labels with product information can also be placed on the paper tray. For the processing of cardboard trays into MAP and skin packaging, Multivac has deep-arch packaging machines and tray sealers that can be equipped with modules for the input and output of the trays. For the tray sealers, trays of cardboard composites are used, and these can be separated per type after use. On the other hand, the trays for the deep-arch packaging machines are made from mono-cardboard. In the deep-arch mould of the machine, the trays are sealed with a plastic layer that can be separated from the cardboard after it’s been used. When choosing the ideal system, the output requirements of the packaging solution plays a crucial part. Skin packaging with a cardboard tray can be produced both with the Multivac deep-arch packaging machines and the tray sealers. Compared to the tray sealer that uses cardboard sheets, the deep-arch packaging machine can use material on rolls, and with this technology, many more packaging designs are possible. Moreover, the rolls can be used more efficiently. MAP and skin packaging made from malleable paper composites can be produced in the same way. Paper and cardboard composites of varying gramme-weights and different functional layers can be used for this. With the standard version of the Multivac deep-arch packaging machines, packaging activities of 20 mm at most can be produced. As with the above-mentioned packaging, the materials of this packaging can be separated per type, and the paper tray is fully recyclable.